Forty-nine CCTV cameras operated by Anglesey council are being switched off as part of cuts aimed at saving £7m this year. 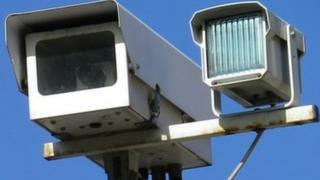 The council said switching off the cameras will save £177,000 a year. Cameras in Holyhead, Amlwch, Llangefni, Beaumaris and Menai Bridge will be decommissioned on Friday. The authority said the decision follows lengthy consultations started last November. But the move has been criticised by the North Wales Police and Crime Commissioner, Winston Roddick. He told BBC Wales that local authorities have a duty to safeguard the public, and North Wales Police has contributed £1m over the last decade to councils towards the cost of running CCTV cameras. Llangefni Town Council on the island had asked for the switch-off to be postponed. But Anglesey council chief executive, Richard Parry Jones, argued that the council's legal duty to protect the public does not amount to a requirement to provide CCTV cameras.